As you can see it includes a matching angel to hold your embroidery scissors so that they will always be close at hand. 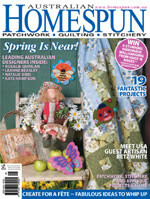 I was also pleased to see that Homespun has included a special on making items for a fete. Something I have been very busy doing over the last couple of weeks. So I was very glad to have some new ideas to work with. Fellow designers and friends Rosalie Quinlan and Leanne Beasley have both made some cute little projects that I'm sure will tempt many buyers on the day. Thanks ladies. I have already made up 10 of the little angels and hope to start on the hearts soon (when I find some spare time!). In what will prove to be exciting in the embroidery industry , I-CLIQQ prepares its array of innovative and intuitive new features. Whether its commercial embroidery on bags, or applique on cushions you'll find the capabilities of I-Cliqq amazing. Take a little time to follow the advent of this new generation software . Embroidery is an age old process, fueled by new technology, automation, and simplicity in intricate tasks. I-CLIQQ programming brilliance brings you new generation power in a constantly evolving industry. 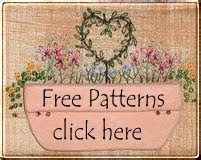 If you Youtube , just search 'embroidery software' to see a few additional clips. Stay on top of things...Downloadable demo version available soon. If you have a flair for creativity , and graphic arts , the vector capabilities of I-Cliqq may be right up your alley.